Paul Manafort, former campaign manager for Donald Trump, exits from federal court in Washington on April 19, 2018. WASHINGTON - President Donald Trump's former campaign chairman Paul Manafort agreed Friday to provide testimony to special counsel Robert Mueller III as part of a plea deal that could answer some of the most critical questions about whether any Americans conspired with Russian efforts to influence the 2016 election. The decision to cooperate with Mueller in hopes of a lesser prison sentence is a stunning development, signaling Manafort's surrender to criminal charges that he cheated the Internal Revenue Service, violated foreign lobbying laws and tried to obstruct justice while opening a new potential legal vulnerability for Trump. "I plead guilty," Manafort told U.S. District Judge Amy Berman Jackson at a hearing Friday morning in federal court in the District of Columbia. As part of his plea, Manafort admitted to years of financial crimes to hide his money from the IRS and promised to tell the government about "his participation in and knowledge of all criminal activities." Flipping Manafort gives Mueller a cooperating witness who was at key events relevant to the Russia investigation - a Trump Tower meeting attended by a Russian lawyer, the Republican National Convention and a host of other behind-the-scenes discussions in the spring and summer of 2016. "This is a big win for Mueller's team. Gaining Manafort's cooperation has always been viewed as the Holy Grail of this investigation," said Robert Mintz, a former federal prosecutor now in private practice. "It now remains to be seen what Manafort can provide, but it is unlikely that prosecutors would have been willing to strike this deal unless they were already convinced that he has valuable information." Court papers indicate Manafort was talking in detail to prosecutors at least as early as Monday - making multiple statements and a written proffer to investigators as the two sides worked toward a deal. In return for his cooperation, Manafort hopes to have years shaved off a potential 10-year prison sentence and see his family hold on to some property. Kevin Downing, an attorney for Manafort, gave a brief statement outside the courthouse after the hearing. "He wanted to make sure his family remained safe and live a good life," Downing said of Manafort. "He has accepted responsibility." When asked whether the deal with Mueller's team is a full cooperation agreement, Downing replied, "It is." He did not respond to questions about whether Manafort has been interviewed by Mueller's team or whether Manafort's defense team remains in a joint defense agreement with Trump's attorneys. Manafort's defenders have long insisted that he would not cooperate with Mueller and that he does not have information that would incriminate the president. Manafort's cooperation was first revealed by prosecutor Andrew Weissmann at the outset of the hearing. Jackson noted that Manafort had agreed to cooperate "fully and truthfully" with the investigation conducted by the office of special counsel, including participating in interviews and debriefings, producing any documents in his control, testifying, and agreeing to delay sentencing until a time set by the government. Under the terms of the deal, Manafort faces a possible maximum prison sentence of about 10 years, though that does not include any likely sentence for his conviction last month in Virginia. His attorneys may seek a lower sentence, and prosecutors did not agree to recommend any sentence. Before Manafort pleaded guilty, Weissmann spent about 40 minutes describing in detail Manafort's criminal conduct - from a 10-year scheme to act as an unregistered agent of a foreign government, to hiding millions of dollars he earned from that work, and then, when investigators were on his trail, trying to tamper with witnesses in the case. After a year of denying the charges and fighting them at every stage of the investigation, Manafort admitted Friday that he did what prosecutors had long said - cheat the IRS out of $15 million and lie repeatedly to try to cover his tracks. While he pleaded guilty to just two of the seven charges he faced at trial, prosecutors forced him to admit to the broad scope of his financial and secret lobbying schemes. "I believe it's fair to say that's probably the longest and most detailed summary that ever preceded this question, but is what the prosecutor said a true and accurate description of what you did in this case?" Jackson asked Manafort. "I did. It is," Manafort said, resting both hands on the lectern before him. The deal will preempt Manafort's trial scheduled for this month. Manafort pleaded guilty to two charges - conspiring to defraud the United States and conspiring to obstruct justice. White House press secretary Sarah Huckabee Sanders issued a brief statement after the announcement. "This had absolutely nothing to do with the President or his victorious 2016 Presidential campaign," she said. "It is totally unrelated." Trump's personal attorney Rudy Giuliani said: "Once again an investigation has concluded with a plea having nothing to do with President Trump or the Trump campaign. The reason: The president did nothing wrong." A criminal information - a legal document filed by prosecutors to detail the criminal conduct to be admitted by the defendant - was filed in advance of the plea. The document is a laundry list of Manafort's admitted criminal conduct, including funneling millions of dollars in payments into offshore accounts to conceal his income from the IRS. "Manafort cheated the United States out of over $15 million in taxes," the document states. In 2012, Manafort set out to help his client - Ukraine's then-president, Viktor Yanukovych - by tarnishing the reputation of Yanukovych's political rival, Yulia Tymoshenko, according to the document. "Manafort stated that '[m]y goal is to plant some stink on Tymo,' " according to the document. At the time he made that statement, he was trying to get U.S. news outlets to print articles saying Tymoshenko had paid for the murder of a Ukrainian official, according to the criminal information. The document also says Manafort "orchestrated a scheme to have, as he wrote in a contemporaneous communication, '[O]bama jews' put pressure on the administration to disavow Tymoshenko and support Yanukovych." Manafort set out to spread stories in the United States that a senior U.S. Cabinet official "was supporting anti-Semitism because the official supported Tymoshenko," according to the document. At one point, Manafort wrote to an associate: "I have someone pushing it on the NY Post. Bada bing bada boom." The document does not identify the then-Cabinet official, and it was not immediately clear whether such an article was published. As part of the plea deal, the government plans to seize five properties worth millions of dollars, including Manafort's apartment in Trump Tower. The deal also calls for forfeiture of a handful of financial accounts and a life insurance policy. The guilty plea is another reversal for Manafort, who has fought vociferously - but unsuccessfully - against Mueller's investigation. The 69-year-old political consultant was convicted last month in Alexandria, Virginia, federal court on charges of bank and tax fraud. Manafort's cooperation with Mueller could provide investigators new evidence or leads to chase; the guilty plea, however, will prevent weeks' worth of headlines about the trial in the month before congressional elections. The longtime lobbyist resigned from his position as Trump campaign chairman in August 2016 amid increasing scrutiny of his work in Ukraine. 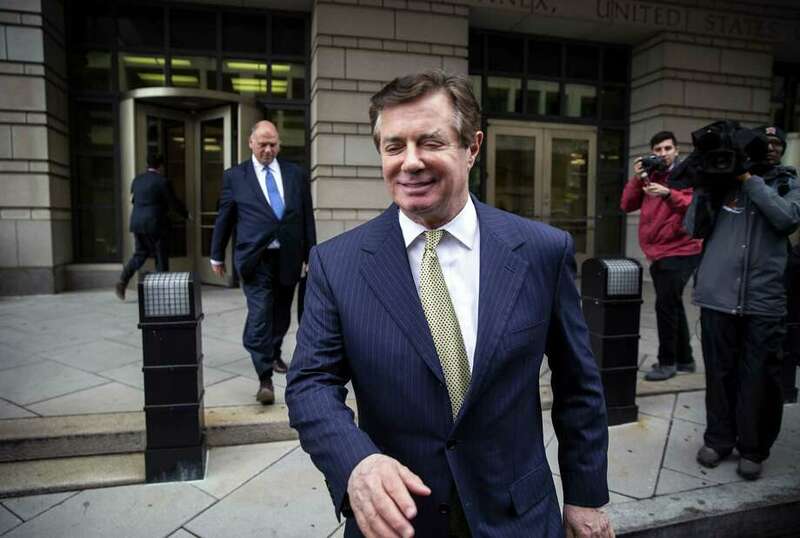 Over a 40-year career, Manafort redefined and expanded Washington's influence industry domestically and internationally, parlaying successful campaigns into lobbying opportunities. But by the mid-2000s, there were signs that his consulting career had slumped, and at times his finances appeared to be shaky. It was in Ukraine that he revived both - in ways prosecutors say violated the law. Both cases brought against Manafort by the special counsel stemmed from his work in Ukraine. The jury in Virginia found that Manafort hid millions of dollars he made there to avoid paying taxes and then lied to get loans when the political party that was paying him was ousted from power and the funding dried up. In the trial scheduled in Washington, Manafort faced charges of conspiring against the United States, money laundering, failing to register as a lobbyist, making false statements and conspiring to obstruct justice by trying to influence witnesses. Manafort had the choice to consolidate both cases into one but declined. He had been jailed since June as a result of the witness-tampering charges. He has yet to be sentenced in Virginia, where legal experts say he faces eight to 10 years in prison under federal guidelines on the eight of 18 counts on which he was convicted. A mistrial was declared on the remaining 10 charges after jurors could not reach a unanimous verdict. In the months leading up to the plea deal, law enforcement officials had come to suspect that Manafort's legal strategy rested in part on hoping to win a pardon from the president, according to people familiar with the matter who spoke on the condition of anonymity to discuss a sensitive issue. Trump has sought advice from attorneys on the possibility of pardoning Manafort and other aides accused of crimes, Giuliani previously told The Washington Post, and was counseled against pardoning anyone involved in the Mueller probe. Trump agreed to wait at least until the investigation ends, Giuliani has said. Manafort's decision to cooperate and provide evidence to Mueller may make a pardon less likely. Several defendants have cooperated or pleaded guilty in connection with the special counsel's probe, including Manafort's former right-hand man Rick Gates; former national security adviser Michael Flynn; and former Trump campaign foreign policy adviser George Papadopoulos, who was sentenced to 14 days in jail last week after pleading guilty to lying to the FBI. The decision by Trump's onetime personal attorney Michael Cohen to plead guilty last month in a federal investigation in Manhattan particularly angered the president, who denounced him as a "flipper" and praised Manafort for being a "brave man" who would not break under pressure from prosecutors. The Washington Post's Rosalind S. Helderman, Tom Jackman, Philip Rucker and Rachel Weiner contributed to this report.